Our nation was founded on many basic rights and freedoms. Through the last several hundred years, many groups have struggled for one of our most precious rights—the right to vote. They have marched; they have protested; and they have given their lives for the right to cast a ballot. Today, many countries around the world are still fighting for this right. Yet, many Americans seem to "throw away their right to vote" by choosing not to register to vote or choosing not to case a ballot. Kids Voting Missouri is trying to turn this apathy around. We understand that today's youth are America's future. Our goal at Kids Voting Missouri is to empower young people early in life to participate in our democracy and let their voices be heard. By participating in Kids Voting students learn about government, democracy, voting, and the rights and responsibilities of citizenship. 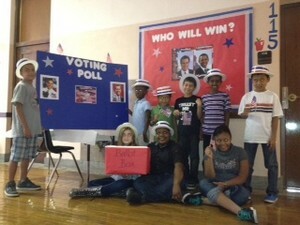 The program creates an expectation that they will become lifelong, informed voters at age 18. Through our parent organization, Kids Voting USA, wonderful classroom activities are available that encourage dialogue and community involvement. Kids Voting Missouri also provides an opportunity for an authentic voting experience for students in Pre-K through 12th grade. Weeks before the election, students learn about the candidates and issues and importance of registering and voting. They talk about politics, majority rule, branches and levels of government; they study about compromise, dissent, and the importance of a representative democracy. They learn the value of respecting other people's beliefs and views and understand that it is okay to respecfully disagree. Then on or near Election Day, via Kids Voting USA's on-line voting system called DoubleClick Democracy, Kids Voting students have the opportunity to vote on many of the same candidates and issues as the adult voters. Kids Voting has always had a "trickle-up" effect, that is, students "teaching" parents about the importance of becoming informed, registering, and voting. KVMO salutes the Ritenour School District for being the first school district in Missouri to participate in Kids Voting way back in 1996. The upcoming Election 2020 will signify 24 years of teaching St. Louis area K-12 students about responsible citizenship and the importance of civic participation. Thank you to all of our participating Kids Voting Missouri school districts and schools who have participated in the program. Through your help and commitment, together, we have been helping students learn just how important civic participation is to the survival of our democracy and democratic principles. 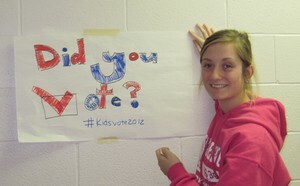 By participating in Kids Voting Missouri, STUDENT VOICES CAN BE HEARD!